One could argue that after the protective gear one needs to safely ride a motorcycle, the most important choice in gear or accessories is which tire is best suited for your particular riding enviroinment. When I started my original around the world journey so many years ago, I used the old Avon Gripsters. Back in the day, this tire served well in both on road and basic off-road applications. Plus, it had incredible life. Tire design and technology continues to advance. Plus, with the increased popularity of ‘adventure bikes’, riders have more options in dual-sport tires. I’ve tried plenty. Sometimes I have to use what I can get. In remote parts of South America, AFrica and Asia, finding tires that fit my bike can be a challenge. 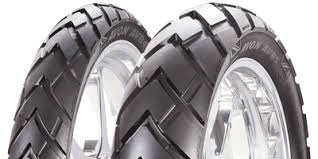 Not long ago Avon released newly designed tires for dual-sport riders. TrekRiders are designed as 50/50 tires. That is, these tires are designed to work 50% for on road, and 50% for off road. So far, I like what I see—and feel. And judging by reviews at several motorcycle online shops, riders are impressed. I installed the new TrekRiders on my F650GS Dakar in July 2018 when I was in Athens. I’ll continue to report on my experience as I make my way around Eastern Europe. These tires are priced right and I’m confident that they’ll deliver both the performance and wear that this adventure—and the many to come in the future—demand.